When I started teaching, web quests were popular, but it took so much time to create the links, figure out a convenient way to distribute the assignment to students, and find an open computer lab, that I rarely had time to implement them into the curriculum. However, thanks to the development of QR Codes and 1:1 iPads, self-directed web quests can be authentically and frequently worked into lessons. 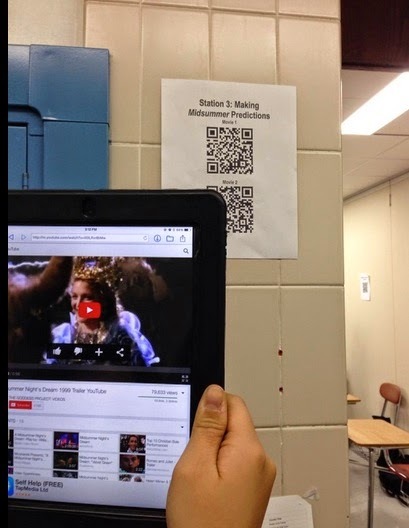 For example, this past month I introduced Shakespeare and previewed Romeo and Juliet through a QR Code web quest. I simply located the websites I wanted students to view, copied and pasted the URL into a QR Code generator, printed out the QR codes, and posted them around the room. Total prep time: less than 30 minutes for a two-day lesson. When students came into the classroom on the first day of the lesson, I simply asked them to download the Shakespeare Stations assignment from Schoology and instructed them to scan the QR codes scattered throughout the room to help them complete each station. When I had students work in stations in the past, I would dictate how long groups spent at each station. However, for this activity, I encouraged students to move at their own rate, and I especially encouraged them to spend more time at the stations they found to be the most interesting. And sure enough—the artists in my class spent the most time sketching The Globe Theater, and the comedians had a blast translating Shakespearean insults into modern day language. And since some of my students already had background knowledge about Shakespeare, they could move more quickly through the stations that were review for them. 1. Not all learning is quiet and orderly. 2. When students are engaged, classroom management tends to take care of itself. 3. Flexible lessons allow students to take ownership of their work.